ESSIE BRIDAL COLLECTION 2016 HAS ARRIVED!! Bridal Season is in FULL SWING! Make sure your salon/spa is fully stocked with this years Essie Bridal Collection!! Whether your client is the guest, bridesmaid, or bride to be - polish her nails for a pristine presentation with the whimsical shades featured in Essie Bridal Collection 2016. Featuring an award-winning formula for optimal durability and chip-free wear, this nail polish adds timeless class to your signature style. The striking shades provides full coverage in a single application and amplifies in opacity with each additional brushstroke. Happy Selling! Vinylux 7-Day Challenge - Day 3 UPDATE! Well, I am almost halfway there - Day 7 is approaching quickly! As of today, Day 3, my Vinylux is still holding strong. It is still very shiny, and I am just showing some minimal wear along my free edge. All in all, it still looks great! One thing I noticed with Vinylux - it is not becoming brittle like traditional polish. Normally, by Day 3 of a manicure, my polish has become brittle and begins showing evidence of tiny spidery cracks. I am not seeing any of that happen with my Vinylux, which is great news! Have you applied Vinylux for any of your clients yet? What are your thoughts on application? The 7 Day Vinylux Challenge - Day 1! Is Vinylux a Game-Changer? CND has been taking the nail industry by storm in the last few years. First, they released Shellac - the biggest nail trend...well, probably ever! They changed the game for salons, providing the Power-Polish gel manicure that applies like a polish and lasts 2 weeks. Now, it seems CND has done it again with the release of Vinylux....but this time, they took it one step further. Vinylux is perfect for application in the salon, but since it does not require a lamp to cure, and can be easily removed with nail polish remover, clients can perform manicures and touch-ups at home. This opens up a whole new avenue for retailing these products to your clients, creating more revenue for your salon! I know what you are thinking - you already have a full line of polishes, gels, and gel polishes. Why do you need more? Simple, 2-step process: color polish, top coat. That's it! No base coat, no curing. SUPER EFFICIENT! 8.5 minute dry time. So fast! Flawless color lasts without chipping for 7 days! Easy removal - no soak-off, no drill. Even remove at home! That all sounds great on paper, right? Well, here is the REAL test! I performed my first Vinylux manicure last night, and will post updates over the next seven days to see how well it lasts. Initial Thoughts: Love the polish formula - applied smoothly, not streaky or clumpy. I felt odd applying color direct to my nail, but I can certainly get used to one less step! I did apply 3 coats of color (instructions recommend 2 coats) - I didn't feel that I had evenly applied the color after 2 coats. I think that is a reflection of my application skills rather than the polish, though. I usually apply 3 coats of color. Each coat dried really quickly - by the time I applied polish to each of my 10 fingers and started at the beginning again for the next coat, the previous layer felt dry instead of tacky, so I didn't end up with weird brush marks near my cuticle. Definite plus! I performed my manicure about 45 minutes before I hit the sack - usually, this is a recipe for disaster. I am the Queen of destroying my manicures with Sheet and Bedding marks. However, my Vinylux was still perfect when I woke up this morning - not a Sheet Mark to be seen, hallelujah! 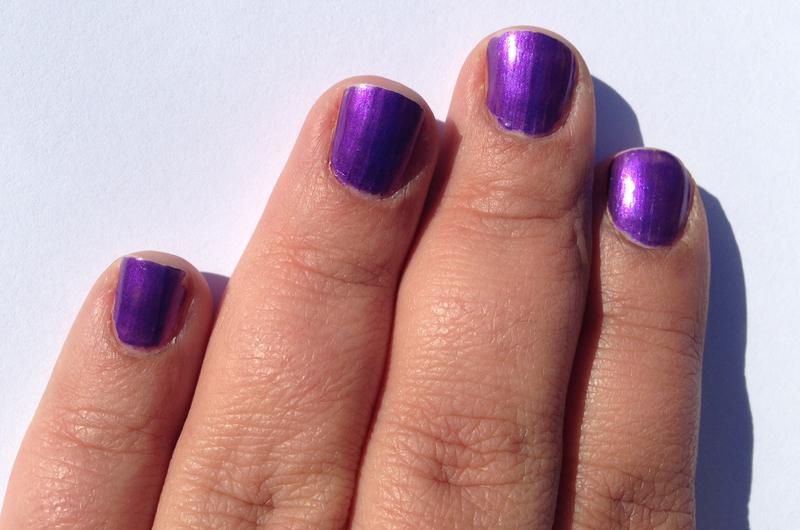 The only oddity is how the polish feels - it is almost rubbery, not hard, shiny, and glossy. It looks shiny and glossy, the finish just doesn't feel like regular polish. But, if it lasts, that is A-OK with me! On a final note: I do feel like the striations in my nails are accentuated with this polish, but I am not sure if it is the color or the polish itself. After my 7-Day Challenge is over, I will try another color to compare! Check back in a couple of days for some picture updates from my 7-Day Challenge....and pick up Vinylux for your salon today!